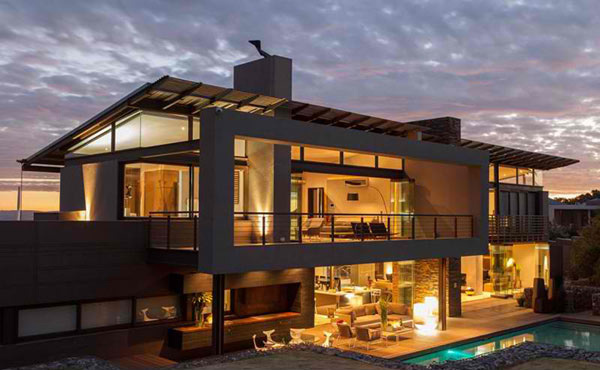 House Duk is located in Meyersdal Eco Estate, Johannesburg, South Africa. This 674 sq.m. 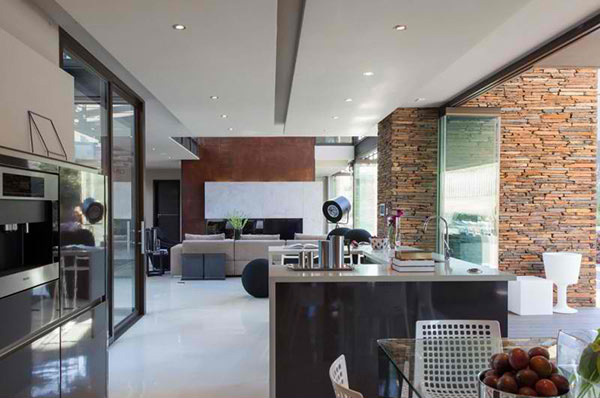 house is another masterpiece by Nico van der Meulen Architects. 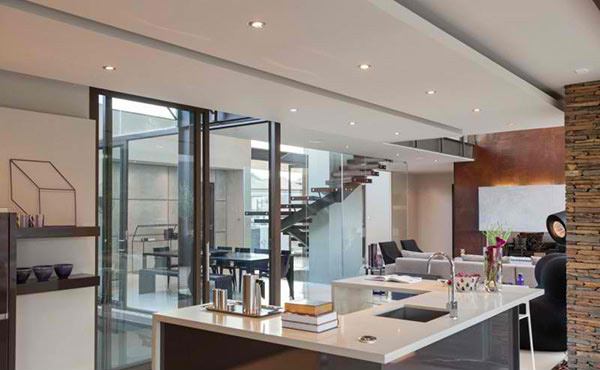 We featured other homes and spaces from this architect and as usual, he never fail to impress us. 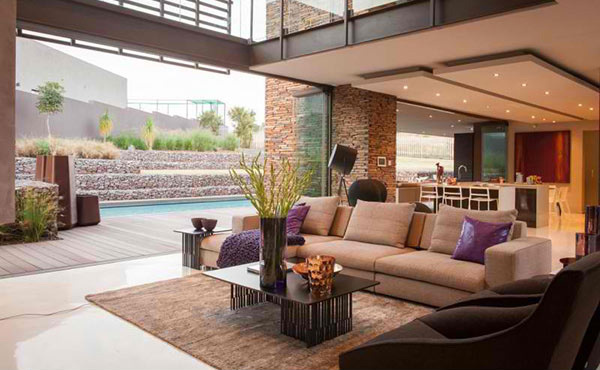 House Duk has an open plan which connects it to the outdoor living which is of utmost importance to the homeowners. Views to the garden is provided in every room. The home has a chic and sophisticated design that combine different decors and materials to achieve an interesting style. Who will not fall in love with the beauty of this house? 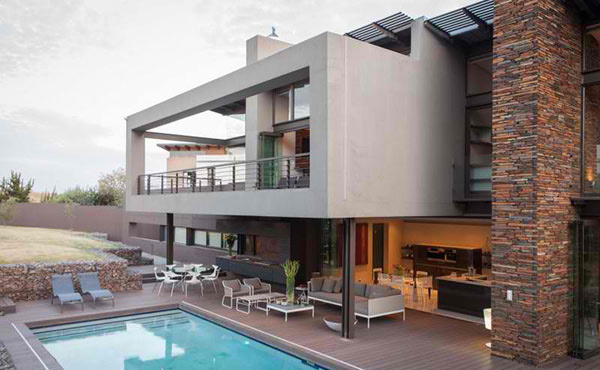 Its openness as well as its modern look is indeed captivating. The facade of the house has geometric lines in it with the use of a mix of materials. The entrance entices one’s curiosity with long stone cladded screen walls. 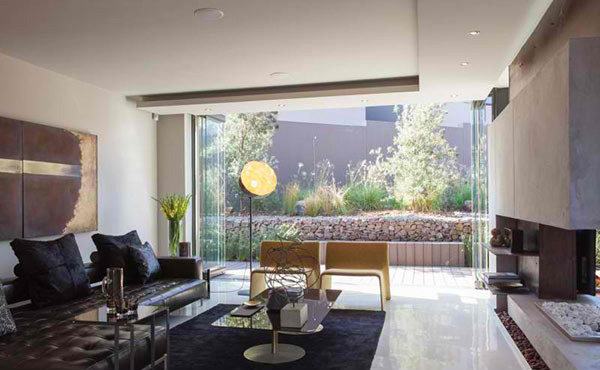 Inside, the transparency and openness of this home that lies behind these solid entrance walls. 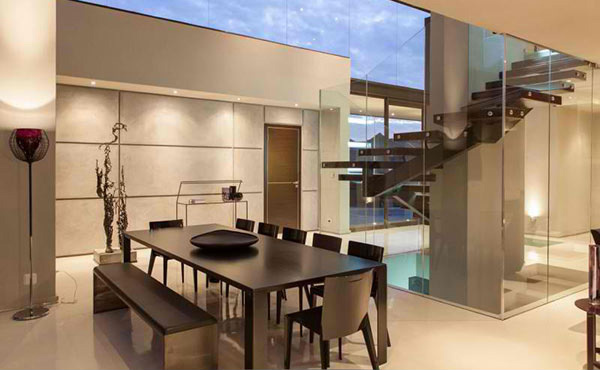 The interior is linked to the exterior through glass walls same as what we can see here with folding glass doors. 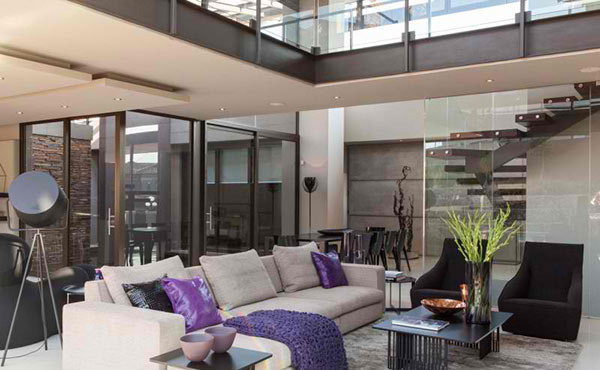 The living room is beautiful with its contemporary design adding some interesting decors as well as some pops of purple. 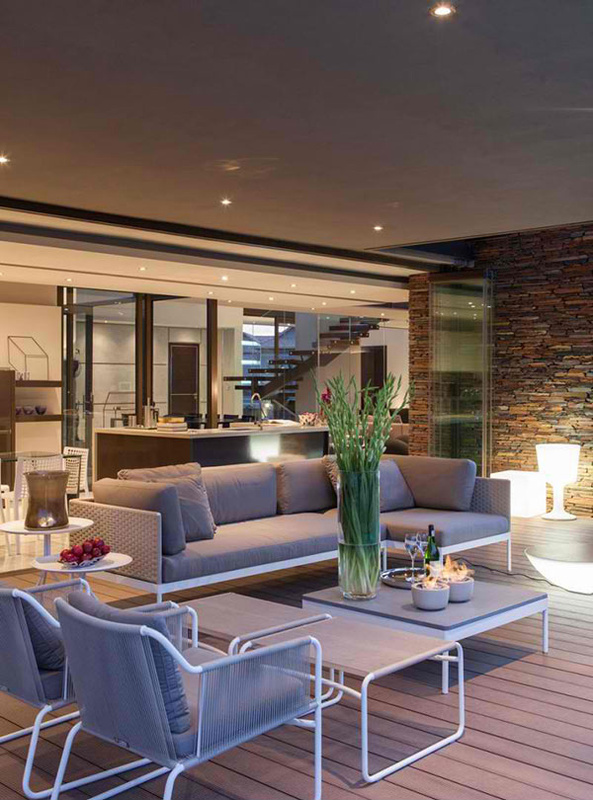 Large living areas seamlessly flowed out onto the covered patio merging the thresholds between inside and outside. The ceiling features some floating planes to give it some depth while carrying some lights on it. Another sitting area is found on the other side of the fireplace which also leads outdoors. Seen here are the kitchen and living room where you can find a brick wall accent that bring some natural touch to the interior. The kitchen is neat and lovely especially with its choice of colors. 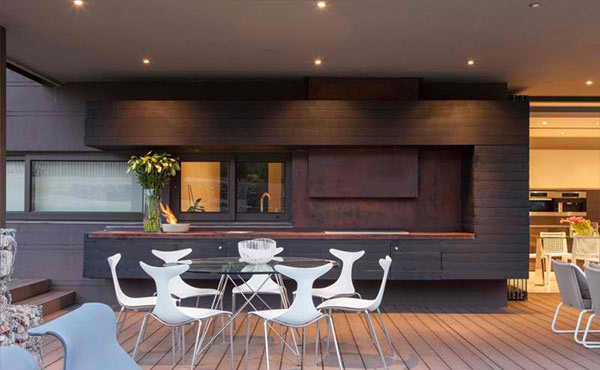 Black dining set graced the dining area which is given more highlight because of the white flooring and glass walls. On the lower level of the house are a dining area and a kitchen. While the upper floor used wood, this one used concrete and utilized gray and white colors. Instead of placing chairs all around the dining table, one side has a long bench on it. In the patio rests some comfy seating where one can gather for night celebrations. The pool area is one part of the house that is admirable. You can also see here the terraced landscape. 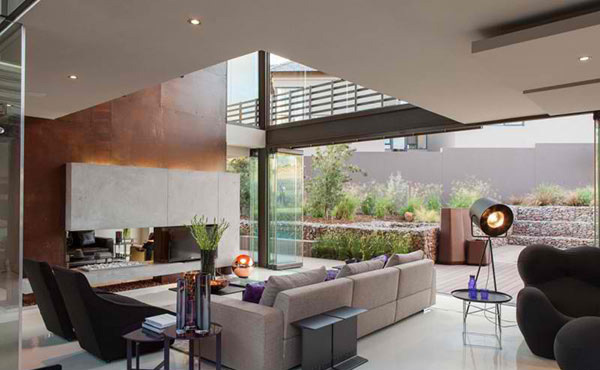 The site has a southern entry that it allowed for the entire northern facade where all the living rooms are positioned to open up onto a private north facing garden. 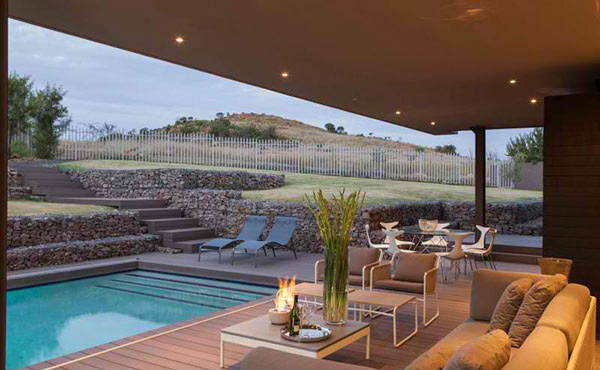 Due to the site sloping upwards towards the north, the garden was stepped and terraced with gabion walls. 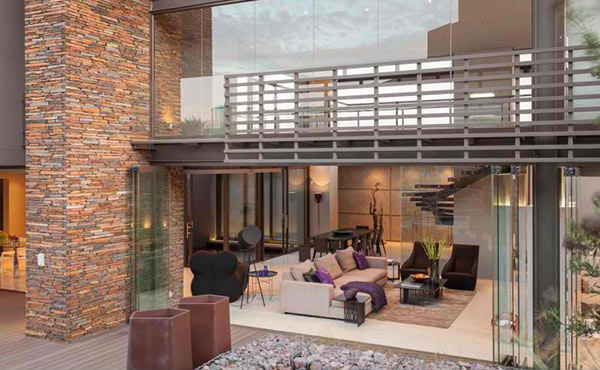 Despite the different levels in the garden, Nico van der Meulen Architects made sure that it will still look as one and not two disconnected areas. 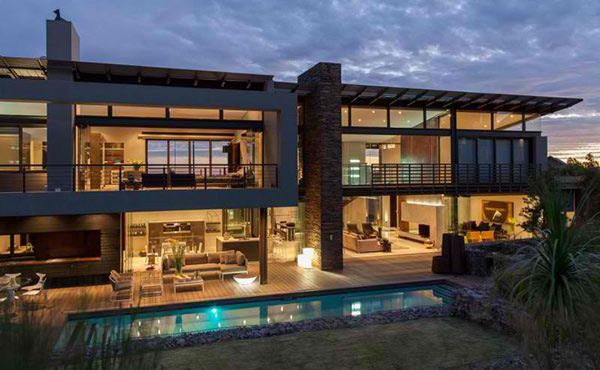 This is indeed one impressive house design from the exterior to the interior and even the landscaping. Overall, this is one house that we will surely pick to be one the design inspirations of a new home we might think of building!